With the Minnesota Wild on the ropes and three games to go in the regular season, Zach Parise returned to the lineup last week after missing four games. The Winnipeg Jets were in town and the season was on the line. Parise did his part, leading the Wild to a 5-1 win with a pair of quick goals, later revealing that he’d been playing through a broken foot and a knee injury down the stretch. The Colorado Avalanche’s win that same night ultimately made it all moot, ensuring that the Wild would miss the playoffs for the first time since 2012, when Parise and Ryan Suter arrived. Parise’s performance against the Jets wasn’t particularly surprising. Now 34, Parise spent half of last season on the shelf with various injuries, ultimately averaging just 0.57 points per game, a new low in his Wild career. Despite more injuries, however, he bounced right back in Year 14, averaging 0.82 points per game, his best rate since 2014-15, and 0.45 goals per game, his best since signing with the Wild in 2012. The Wild suffered accordingly when he wasn’t in the lineup, scoring just four goals during Parise’s four-game absence down the stretch. 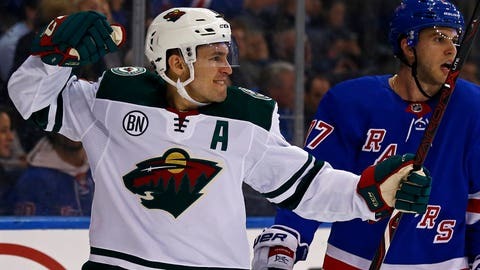 It was effectively another 30-goal season — 28 goals and 33 assists (61 points) in 74 games — for Parise, who led the Wild in goals and points for the third time in seven season. He was one of just two players 34 and older to break 60 points this season, while only San Jose Sharks forward Jose Pavelski had more goals. Outside of Pavelski, in the past five years only Jarome Iginla, who had 29 goals and 59 points in 2014-15, his age 37-season, has scored more at that age. Parise did it all while skating 18:40 per game, more than any other forward currently with the Wild (Mikael Granlund, traded to the Nashville Predators at the deadline, averaged 18:43). It’s fair to wonder where he goes from here, of course. Parise turns 35 in July and has six years left on his contract at a cap hit of just over $7.5 million. A rising salary cap has made that number more and more manageable in recent years, but hockey’s aging curve isn’t usually kind to forwards with Parise’s nose for loose pucks tendency towards net-front battles. Still, this wasn’t exactly an anomaly. He finished the 2017-18 season on a tear, scoring 12 goals in 18 games during the final month of the season, then scoring three goals in three playoff games against the Jets. Parise, it appears, has plenty left in the tank.